A few weeks ago I wrote this post for GeekMom. I’m reposting it here because today I have orientation for my new teaching job. The wardrobe is on my mind a lot. It’s that time of year again, when back-to-school commercials take over the airwaves and summer feels like it’s slipping away. But all of the school talk is focused on getting the kids ready for a new year. What about the teachers? We like new things in our closets, too. 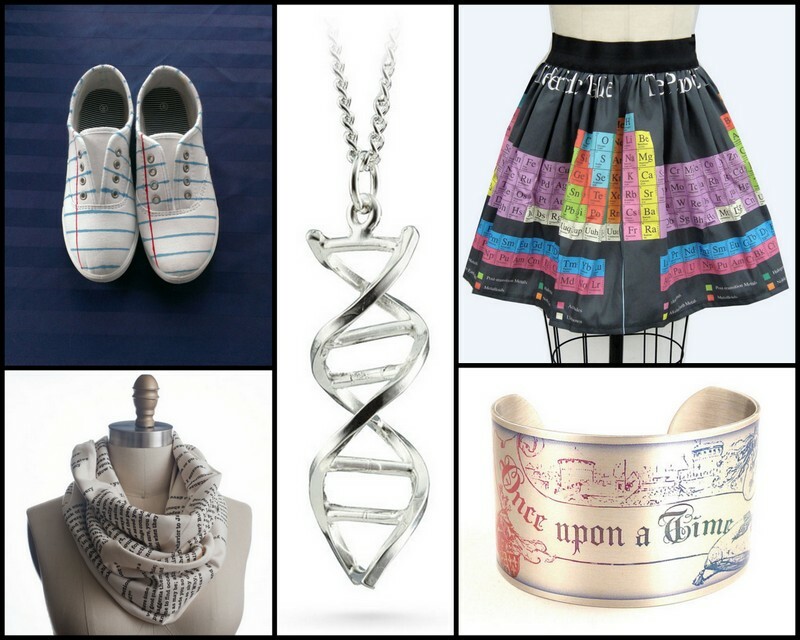 Here’s a collection of some great geeky pieces, from dresses to phone cases, to help teachers and librarians stand out this year. Pick one special piece or blow your budget on all of them, but it’s time to let your nerdy flag fly. The “literary and historically inspired jewelry” in accessoreads Etsy shop is all covetable. From thecard catalog cuff to this Once Upon a Time cuff ($38), there are plenty of statement pieces here. Modcloth has endless cool options for your closet, including this Heart and Solar System dress($74.99) for a full-on Ms. Frizzle classroom moment. Storiarts makes gorgeous (and subtle!) book scarves, like this Pride and Prejudice infinity scarf ($42). Check them all out, truly fabulous. It’s no secret here that Go Follow Rabbits makes amazing skirts. The Periodic Table Full Skirt ($45.99) is perfect for the classroom. It’s always helpful to have a nice big pouch to keep in your school bag for pencils, makeup, money, whatever. Out of Print’s Banned Books Canvas Pouch ($12) shows your solidarity with great misunderstood works of literature, too. Twinkly, sparkly Zohara Star Print Tights ($35.95) take away the sting of that snow day that never arrived. Jeffrey Campbell’s Pencil Me In flats ($99.99) might be a splurge on a teacher’s budget, but they are just crying out to be worn for Back to School Night. Brainy and chic. Tartx’s William Shakespeare In the Stars scarf ($19) hits both points. The Notebook Paper Graphic shoes ($29.95) from ShopJustWish are great for class trips, football games, and Field Day. Keep all your school stuff in this Library Card Tote ($20) from Out of Print. Any science lover can rock ThinkGeek’s DNA Pendant ($24.99). Geography rules! And so does Cruel Candy’s World Map Printed dress ($97.51). Get yours custom fitted to your measurements and rock that classroom. Maybe these Hamlet Black Leggings from BlackMilk ($75 AUD) are a little distracting in class, but you can still let everyone know you’re an English teacher when you’re off duty. Don’t forget your phone! It needs a new outfit, too. Kate Spade’s leather Dictionary Wallet for the iPhone 5 ($85) makes your smartphone look even smarter.